Setting up for the grand finale. The Monkey Island games have never really been dark. There's been some grim moments here and there, but they always had their fair share of humour and weren't really depressing or anything. Well, if you play this chapter, prepare to have your mind blown! As goes without saying now, this chapter is a no-no unless you've played all three previous ones. It is, yet again, a direct sequel, meaning jokes and other such things will go right over your head unless you're fully up to date. After escaping from the manatee and locating La Esponja Grande, Guybrush was knocked out by Morgan LeFlay, who was still unders from the Marquis de Singe to capture and bring him back. Therefore, the objective for this chapter is rather simple: escape from jail and prove yourself innocent! You'll want to break out as fast as you can once you find out who the prosecutor is — it's none other than Stan, the franchise favourite salesman who always wears a checkered jacket and makes wild gestures during everything he says. Although series fans will no doubt already have pestered him in other games before, he's still willing to help you a little bit. But being a salesman at heart, he is of course also trying his hardest to make a quick buck out of the whole situation! 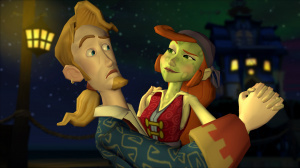 As in all previous chapters, you must solve various smaller puzzles in order to clear the main issue at hand - For some reason, almost all of Flotsam Island's citizens have accused Guybrush of crimes he did not commit, and you'll have to try and proof your innocence for every single accusation. Once you're a free man, the chapter is not yet over. Because of a rather huge plot twist, Guybrush also wants to get revenge on de Singe, after which you'll be hit with an even bigger twist, which makes the wait for the final chapter almost unbearable! Although he's not as amusing as Murray, Stan helps make this chapter almost as good as the previous one. He's not voiced by the man who's already voiced him twice before, but his new voice is still very entertaining and fits his character perfectly. You'll also notice that both him and a handful of other characters in this chapter have completely new models rather than simply slightly changing other ones — a very welcome change. You'll also see every single character from the first chapter again, which means there's a rather huge supporting cast here. Being the largest chapter so far in terms of content, it was of course rather futile to have any hope for fixed framerate and sound — and that seems correct, because the issues still prevail. Try to forget them and just pay attention to the humour! There's been nothing wrong with the gameplay in the series so far, and obviously nothing changes here. The puzzles aren't really too hard to figure out if you pay attention to what the characters say, meaning you should once again plow through the whole thing in about 2 to 3 hours. Be warned: the plot twist at the end is so big, that there's absolutely no way you don't want chapter 5! 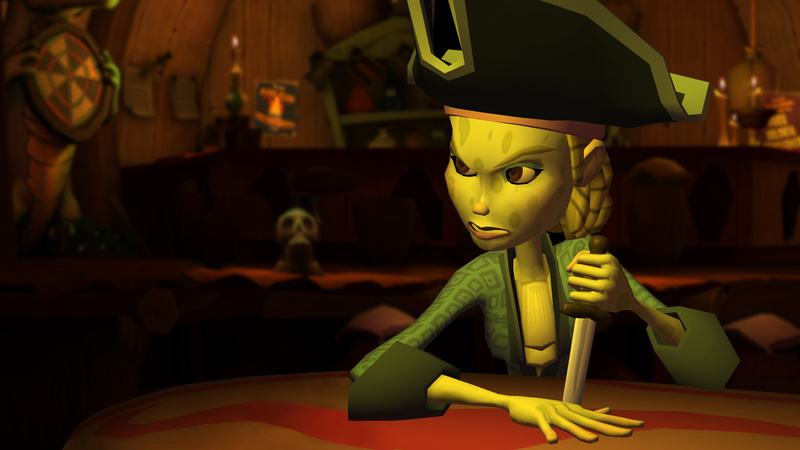 "Basically, same old, same old..."
How is that a bad thing when it's Monkey Island. That's one of the best series in gaming. Good review. But I just don't really have any interest for this series. I'll be getting this tomorrow. Can't wait! I love Hotel Dusk and both Another Code's. Should I get this and the other episodes? So how is the lag? Is it gone? if ur not interested in monkey island dont comment on it. Basically the same brilliant puzzle adventuring. Don't care about the quirks and kinks. 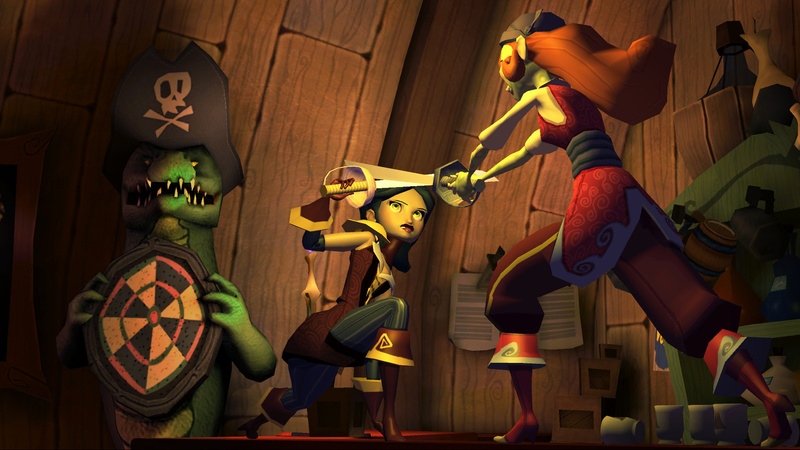 @Gavin, I love Hotel Dusk and Another Code and I also love Monkey Island. Get this and the other episodes. The lag, like the last two installments isn't bad. This chapter has the best ending. Excellent twist and I can't wait to get the final chapter. Wow, never heard the Hotel Dusk comparison before, thats one of my favs. I think I'll have to start getting these. I haven't tried any of them so I don't get what the framerate issue is. Does it look choppy or something? Is it a really low framerate with bad sound or something? Thanks for saving me 4000 points so far. Already finished this chapter over a month ago. 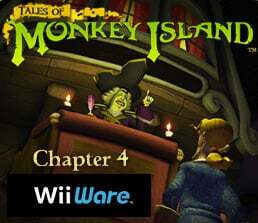 I thought 1-3 on wiiware had audio/lag issues- does chapter 4 have the same? Gah! The game has frozen twice on me in the last hour or so. I know some of the SBCG4AP episodes had that problem, but until now it had seemed like ToMI was at least free of that nuisance. As per usual, dust down that PC and buy it from the Telltale store, save yourself $15 on the set and have an option of a hard copy once Sam & Max Season Three gets underway. That was easily one of the most epic things I have ever played. I eagerly await the final chapter. get it out in the UK right now NOW NOW NOW! Easily the best, and toughest one of the series so far, I'd give episodes 1-2 a 7/10 and 3 and 4 8/10. The lag and clipping really aren't that much of an issue, sure they're there, but in no way game-breaking. Bring on chapter 5! Thank you, megaboomface. Your comment was enlightening and wholly appropriate to this article about a series of games you have consecutively shown no interest to play, yet somehow feel the urge to comment on. Really, THANK YOU. Thank you, BrickRockwell. Your comment was wholly constructive and appropriate considering the fact that you're attempting to stir up trouble over a silly comment left well over a year ago. Really, THANK YOU.